Blackout EZ Window Covers, 100% Total Window Black Out for Night Shifters, Home Theaters, Napping Kids, RVs and More! Custom fit any window size in minutes! The Blackout EZTM window cover provides 100% Total Window Black Out for night shift workers, home theaters, napping kids and more! The exclusive hook & loop VelcroTM Fastening System seals tight around the window frame, without the light around the edges you have with black out curtains, liners, shades and blinds. Simply place the cover over the window and press around the edges to seal. Pull the cover off when light is desired. Rolls neatly away when not in use. Can be installed/removed daily or leave in place for the ultimate sleep cave. 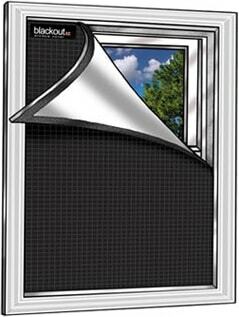 Works with your existing window treatments.. the cover attaches directly to the window frame underneath what you currently have! Why Blackout EZTM window covers? Blackout EZTM window cover is the only window treatment that provides total blackout. The exclusive hook & loop VelcroTM Fastening System seals tight around the window frame, without the light you have with blackout curtains , liners, shades and blinds. Blackout EZTM window covers install in minutes. Printed cutting lines guide you to a perfect fit or choose our custom options. Unlike black out curtains, liners, blinds and shades, Blackout EZTM requires no measuring, tools, sewing, screws, hooks and rods. Only Blackout EZTM has the Exclusive Duplex Fabric. The white exterior side has a nice clean appearance and reflects the sun while the interior color compliments your room. The special fabric allows the adhesive backed hook & loop VelcroTM tape to stick in the heat of summer and the cold of winter. The fabric is practically indestructible but cuts easily with scissors. Blackout EZTM is easy to use and care for. Simply place the Blackout EZTM over the window and press around the edges to seal. Rolls neatly away when not in use. The fabric wipes clean with a damp cloth unlike other black out window treatments that require washing and dry cleaning. Best of all, you can keep your decorative window treatments. Blackout EZTM attaches directly to the window frame underneath your current window treatments.